That’s a very simple word: God. Three letters, one syllable, very easy to say. We see this word on our money; we print it on our bumper stickers and plaster it on billboards. Preachers say it with such confidence—as if they have the meaning of this word all figured out — God squished in a box of fancy-sounding words and quotations by longdead theologians. Too often, we hear this word thrown around casually and carelessly, like punctuation at the beginning or the end of a sentence. It’s even common to hear someone use His name as an outcry of petty disgust! What does God mean? Does belief in what stands behind that little word matter? The answer is an unquestionable “yes.” Different beliefs about it have caused wars and have healed families. The word God has been used for great comfort and misused causing great pain. It causes some to feel peace and others to boil with anger. your understanding of and belief in Him will be deepened and sweetened. God, open my heart, mind, and soul to Your Word as we learn more about who You are. I already “believe in You,” but I want to Believe in You! Reveal Yourself to me so I can live in You in new, truthful ways. Amen. 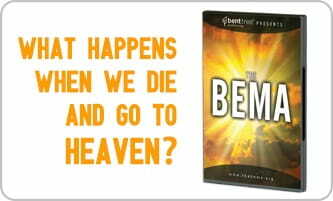 Based on the novel, The Bema: A Story About the Judgment Seat of Christ by Tim Stevenson, The BEMA Drama was initially performed by Pete Briscoe as part of a sermon series in 1999. In 2000, Bent Tree performed the drama a second time and created a VHS video with the hope of sharing this life-transforming message of living for THE day beyond the walls of Bent Tree.